Barnes bullets have historically had the reputation of offering quick, clean and humane kills. Now they are taking their highly regarded bullets to the next level loading them in ammunition. Loaded with the Barnes Triple-Shock X (TSX) Bullet, this round offers devastating results on varmints. The Barnes TSX bullet is made of 100% copper and contains no lead. When the bullet expands, four razor-sharp cutting petals are created, allowing the bullet to penetrate farther through tough bone and tissue. These bullets usually retain 100% of their original weight. VOR-TX ammunition is manufactured to precise tolerances to ensure excellent accuracy and consistent velocities. This ammunition is new production, non-corrosive, in boxer-primed, reloadable brass cases. 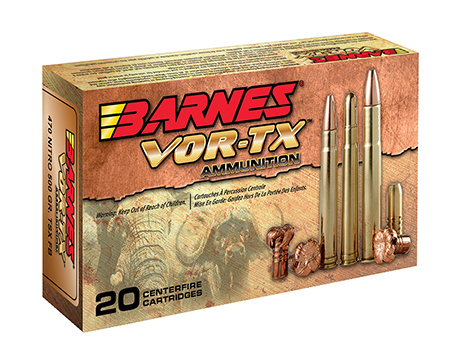 Barnes VOR-TX is precision ammunition loaded with the deadliest bullets on the planet. Barnes, the leader in bullet innovation offers hunters the ultimate in accuracy, terminal performance and handloaded precision in a factory loaded round. Offering double-diameter expansion, maximum weight retention and excellent accuracy, the TSX, Tipped TSX and TSX FN provide maximum tissue and bone destruction, pass-through penetration and devastating energy transfer. Multiple grooves in the bullet’s shank reduce pressure and improve accuracy. Bullets open instantly on contact – no other bullet expands as quickly. Nose peels back into four sharp-edged copper petals destroying tissue, bone and vital organs for a quick, humane kill.